Hello crafty friends! Thanks for stopping by. This post is part of the weekly Brutus Monroe Inspiration Team blog hop. Our assignment this week was to use some of the February subscription products! I chose to use the stencil and the stamp of the month. If you haven't seen the full stencil yet, it's actually an egg shape with the pretty swirls and dots. 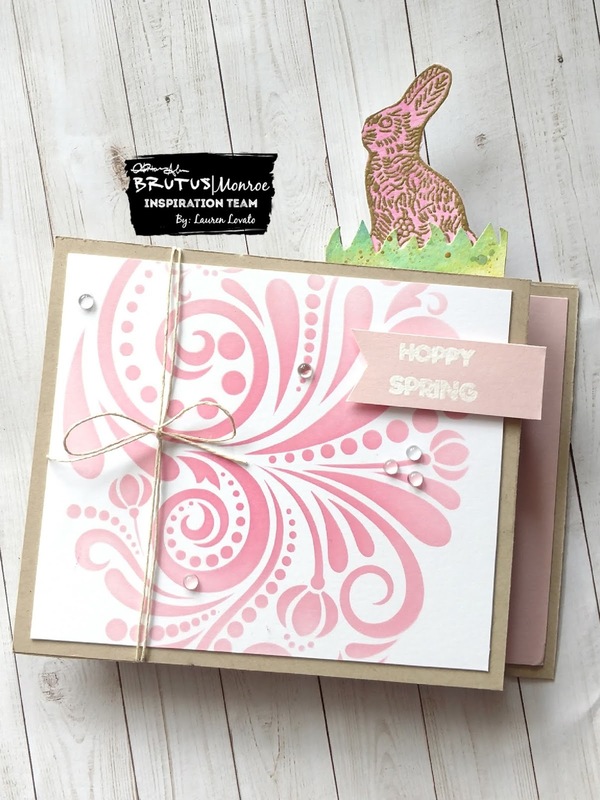 The stamp is the cute little bunny and the words "Hoppy Spring". It also includes a little peep shaped stamp, but I didn't use it for this project. On instagram I spotted a really cool "wiper" card on the account @alilovescardmaking and I had never tried one before! I searched for "wiper card" on YouTube and watched a few tutorials to get an idea for the mechanism. I cut the main card base pieces from Lunch Bag cardstock, and then cut an Alabaster cardstock panel to fit on the front. I used Honeysuckle and Rouge inks blended over the stencil, with the Rouge concentrated in the center. I stamped the bunny on Aqua Pigment paper and heat embossed it with Gilded EP. I painted it with Pink aqua pigment and then fussy cut it when it was dry. I used the fussy cutting scissors to cut grass shapes into a small piece of green inked paper left over from another project, and glued it to the piece of cardstock that pops up out of the top, along with the fussy cut bunny. I put the stenciled card front on, and then ran a piece of twine through the open middle of the card and then tied it in the front. I heat embossed the sentiment with Alabaster EP onto a strip of Honeysuckle cardstock and trimmed it into a banner shape, adhering it to the front with foam tape. I stuck a one-inch strip of Honeysuckle cardstock onto the side flap as well. 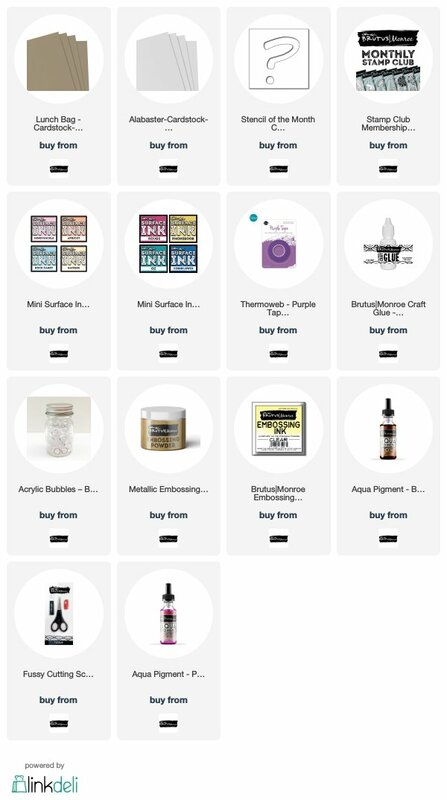 Have you made anything with the February subscription products yet? Share your projects, and be sure to use the hashtags #BrutusMonroe and #CreateYourOwnEnding so we can see what you make! 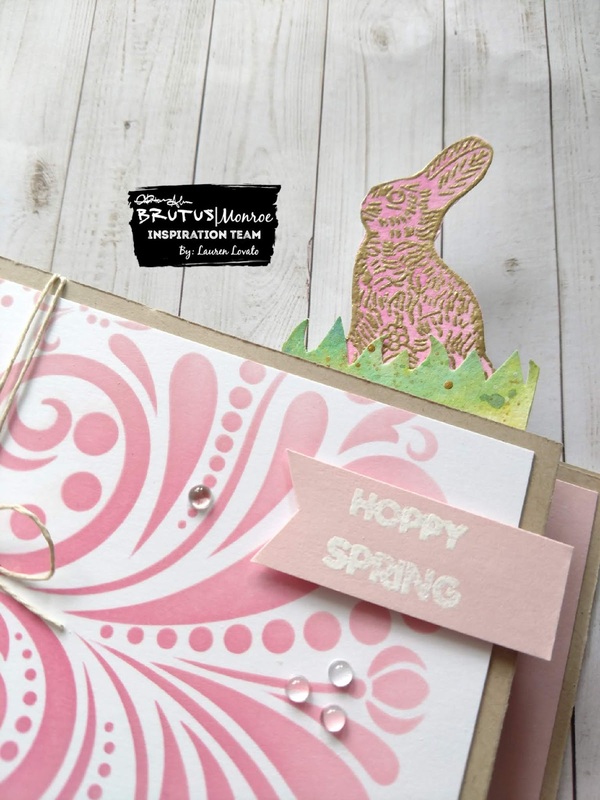 Hop to Luisana's blog next! Hello crafty friends! Lauren here, and I am so excited to be a part of this hop! 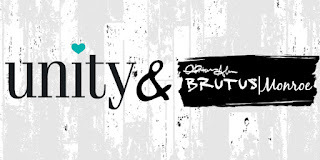 Starting my blogging journey with a collaboration from two AMAZING companies, Brutus Monroe and Unity Stamp Co., is a dream come true. Brutus Monroe Trick or Treat! Hey crafty friends! Happy Halloween! This week's blog hop is Halloween-themed, and Brutus Monroe is offering a treat! ***GIVEAWAY! *** We wanted to have a little fun with our blog hop this week, and give away ONE $25 GIFT CERTIFICATE to the Brutus Monroe store! Just leave a comment on each blog post along the hop to be entered! Winner will be announced on next Wednesday's blog hop post, November 7th, on the Brutus Monroe blog. Please remember to check back next week to see if you are the winner! 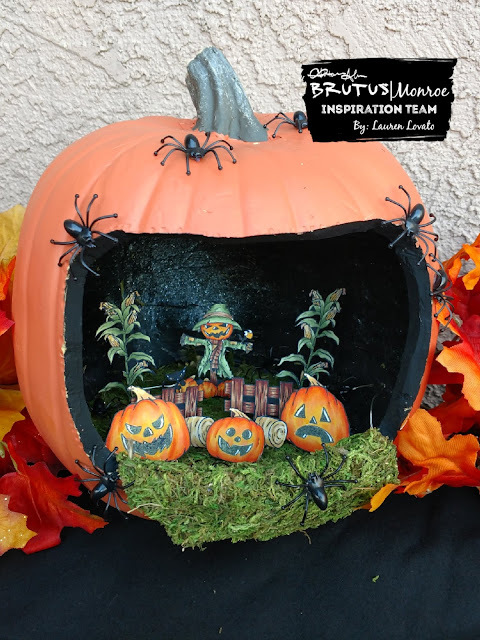 ***BONUS ENTRY- Post ANY project you have created in the Brutus Monroe Fan Club group on Facebook with the hashtag,#TrickOrTreatGiveaway! Good luck! Hi crafty friends! 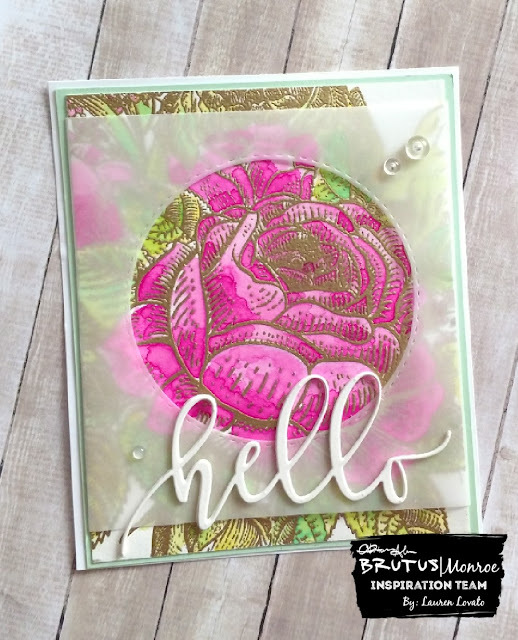 This week's Brutus Monroe blog hop is focusing on florals. I have two projects to share today, both using the exact same products in different ways. 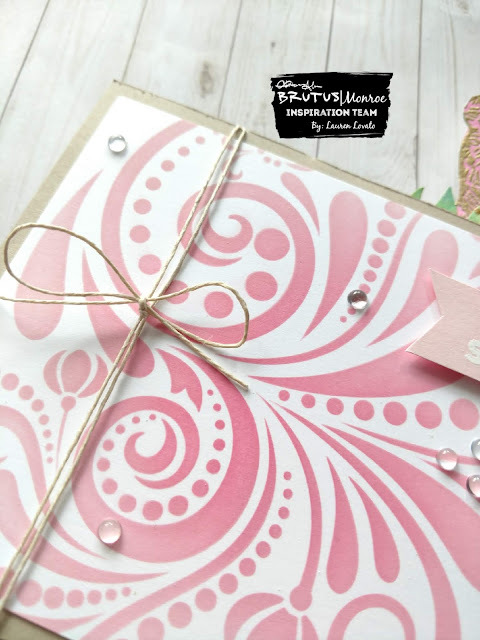 For both projects, I used the Enchanted Rose stamp . The enchanted rose is the first stamp I ever bought from them! It's so pretty, and has a lot of big open spaces to color. For the first card, I decided to heat emboss the image using the Gilded EP onto some aqua pigment paper. I used Pink aqua pigment for the flowers and Yellow and Green aqua pigments for the leaves. I die cut a circle from vellum and wrapped it around the from of the card. I die cut the "Hello" sentiment 3 times from aqua pigment paper, and layered them together for dimension. I matted it on Speckled Egg cardstock and a white card base. I finished it off with a few clear dew drops.